Choose from a range of standard sizes and specifications or starting with an open plan unit we can create space to meet your needs. 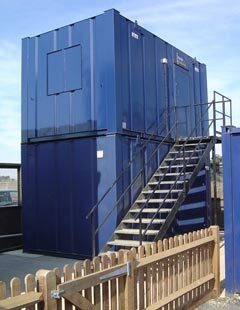 Any two units of the same size can be stacked and accessed via an external staircase erected on site. We will supply a foundation plan in order to safely stack cabins, or even arrange to build them for you. The basic building frame is formed from heavy gauge mild steel sections, each fully welded to form a rigid framework into which the wall panels, doors and windows are fitted. The base rail is a 3mm thick ‘z’ section, which is fully welded into the corner posts. The floor joists are welded inside the base rail at 406mm centres to form the floor frame. The corner posts support the 50mm x 10mm flat bar. This runs around the top of the wall panels to form a rigid section onto which the roof panels are fitted. Reinforcing sections are welded inside the flat bar both across the unit width and also longitudinally to complete the framework. This section sits underneath the roof panels to provide additional support to help prevent roof damage and improve water drainage. The frame is completed by 6mm plates, which are welded to the base and top of the corners. These are fitted with a basic hole and pin to provide a positive location when the units are double stacked. 15.5mm WBP plywood is fixed to the 100mm x 50mm heavy gauge joists at 406mm centres using self drilling screws to form the floor deck. The floor is finished with 2mm vinyl complete with white PVCu interior trims. 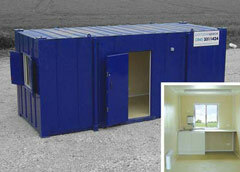 *As an option, the floor can be underdrawn with 1.6mm galvanised steel sheet and insulated with 50mm Rockwool. 1.6mm thick corrugated steel panels are fully seam welded to each other and the unit framework to form an extremely robust and rigid wall section. The internal lining is 4mm pre finished plywood wallboard complete with white PVCu interior trims. The lining sheets are mounted onto an internal framework of 70mm x 34mm timber at 406mm centres, which also encloses the 80mm fibreglass insulation. 1.6mm thick profiled self supporting roof panels are fully seam welded to each other and the framework. The internal ceiling is 4mm white pre-finished board supported by 70mm x 34mm timber at 406mm centres. This also supports the 80mm fibreglass insulation. The void between the roof and ceiling is ventilated by hidden vents down each side of the unit to reduce the build up of condensation. All external wall surfaces are manually scraped down to remove welding spatter and then all surfaces are degreased thoroughly. An etch primer is applied to all areas followed by the addition of a high build primer to the welded seams and other relevant parts. The internal and external surfaces are then given one coat of high build anti corrosive compliant paint to the specified finish colour except for the corner base plates. Internal faces of doors and window shutters are also painted to match the external colour. The whole system is applied using an air assisted airless system to provide an excellent surface finish. The standard paint finish is a single colour of your choice from the BS 4800, BS 381C or RAL colour ranges. Double skin steel doors are welded into a 50mm x 50mm rectangular hollow section framework via a full length zinc plated piano hinge. The external steel skin is 2.0mm thick, with the internal skin formed from 1.2mm thick sheet steel. The anti jemmy protection is provided down the closing edge of the door at both the top and bottom. The standard locking system is a brass roller catch for day time closing and top and bottom and two 5 lever suited deadlocks for security. The door is fitted externally with a welded steel pull handle and internally with a welded pressed steel handle. Window frames are formed from 6mm thick rolled steel angle which allows the 915mm x 915mm aluminium framed sliding windows to fit inside. The frame is also designed to allow the 2.5mm thick steel shutters to close into it via full length zinc plated piano hinges. These are held closed by top and bottom spring bolts on both leaves of the shutter and in the open position by anti-luce retainers. The shutters interlock and are protected from jemmy attack by the frame and pressed flanges to the edges, completed by a 3mm 90 degree steel angle cloaking the shutter opening.